Design agencies are like a favorite pair of jeans. They fit perfectly back in the day. They were expensive, but worth it because they made you look good. But times have changed. Your company has grown up. How can you tell if it’s time to clean out the creative closet? 1. 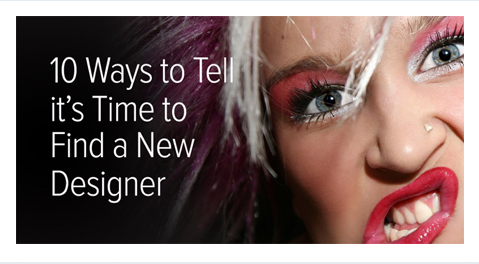 You haven’t seen your designer since they turned you over to the Junior Account Executive last year. 2. You hear more about their awards than you do about your results. 4. They still think it’s about them. 5. Their website is responsive, but it’s the only thing about them that is. 7. You love a good wine, just not from your design firm because of a tight deadline. 8. You’ve softened your critique out of fear of hurting their feelings. 9. Because “All the rage” is not a business strategy. 10. You love surprises, just not on your design invoices.